Tickets for the much maligned ITV pay-per-view card headlined by Chris Eubank Junior-Renold Quinlan went on sale yesterday, and the card just became a little better in terms of value for money. British heavyweight David Price will support the main event in a fight with Christian Hammer, as annonced by promoter Erol Ceylan . Price, still attempting to regain the status and respect he held before losing to Tony Thompson (twice) and Erkan Teper (both fighters subsequently failing drugs tests) will be taking a reasonably big step in the right direction against Hammer. Hammer, 20-4(11) has reeled off three wins since losing to Tyson Fury in February of 2015; beating Sherman Williams, Michael Sprott and, last time out and most significantly, Teper, against whom he won the WBO European title. 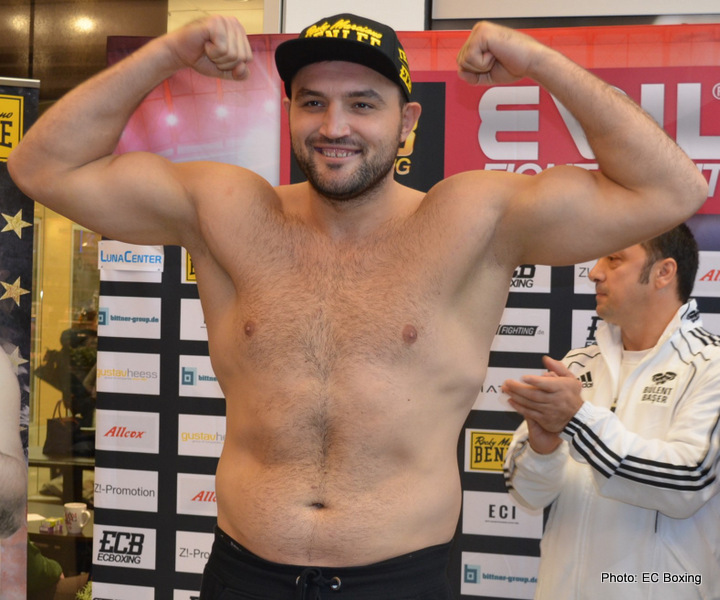 The 29-year-old Romanian who lives in Germany has been stopped three times, but aside from his pro debut, Hammer has only lost in good company – huge Pole Mariusz Wach being the third man to have stopped him, in 2010. Price has won two low-key bouts since being taken out by Teper, and he is working with new trainer Dave Coldwell. Hammer will be the first “live” opponent Price, 21-3(18) has faced in quite some time; the loss to Teper taking place back in July of 2015. Price will again enjoy significant height and reach advantages in the upcoming fight, but his chin will always carry a big question mark, at least in the opinion of many fans. If Price can get a clear win and look good in getting it – a KO would of course be a great bonus for him – it will be a big boost to his confidence as well as a statement of intent. Hammer though, if he’s been given enough notice for the fight and if he’s in top shape, could well beat Price. If this happens, Price will surely have nowhere to go but into retirement. This heavyweight match-up really is a crunch fight for the 33-year-old. This fight could also entice more armchair fans to fork out the cash to see the February 4 show in London.